Pomegranate. Its jewels the color of garnet. Its jewels the color of Christmas. There is no fruit more Christmas-y than pomegranate. 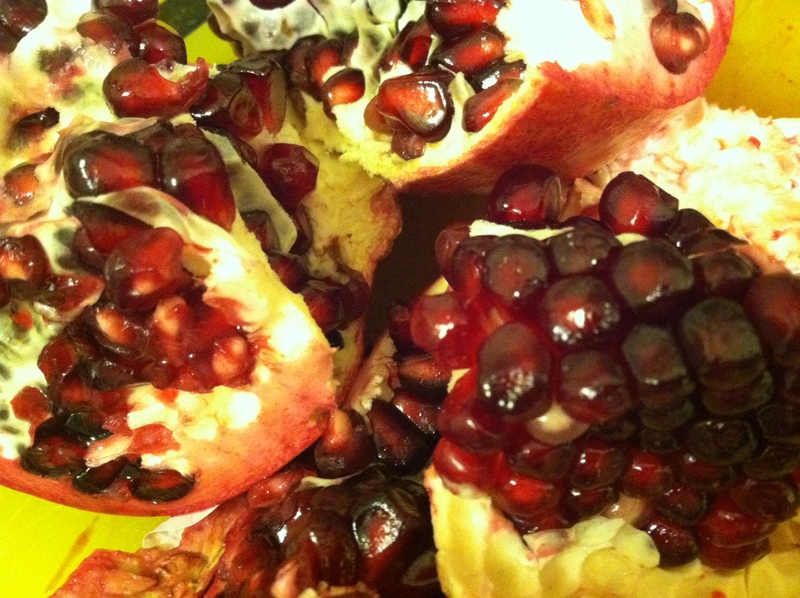 When I was a little kid, growing up in Brooklyn, I ate pomegranate. I remember pulling apart the peel and membrane to find the clusters of seeds and biting into them–taking a dozen or more into my mouth. The tart-sweet burst of every clean, almost-transparent, juicy seed flooding my taste buds with the clear flavor of “awake & sing!” I ate at the coffee table in front of the TV, sitting on the floor. I didn’t consider them exotic. They were Chinese Apples. We called them Chinese Apples then. I don’t know why. But I looked it up. I found that Chinese Apple is British English for pomegranate. True? Don’t know. Wikipedia says it’s an ancient fruit likely originating in the area of Iran. The fruit has been written of in Babylonian texts, the Bible, Homeric Hymns and the Quran. The name, in Latin, means apple (pomum) with many seeds (granatum). Carbonized pieces of pomegranate were unearthed from the Early Bronze age in the West Bank. A whole pomegranate was in the ancient Egyptian tomb of Djehuty, who was a butler to Queen Hathshepsut. Ancient Greek mythology includes pomegranate as the “fifth business” in stories of the gods. For Persephone, eating 6 jeweled seeds condemned her to the underworld for 6 months every year causing her mother, Demeter (the Goddess of the Harvest), to mourn for 6 months, not letting anything grow–hence the explanation of the seasons. In ancient Greece pomegranate is considered the blood of Adonis. And for us? In modern times? Do we just eat the fruit and count its nutritional properties? Void of magic and stories? I see it as part of my personal history. A memory of first encounter that zaps me back to childhood bringing along with it feelings of being a child and what my child world-view was: Small. New. At the dawn of accumulating experience. The feel of the smooth seed in my mouth is as familiar as my years on earth. And then…why not?…there’s still time to create a story of pomegranate. One that stars the fruit and makes it a hero. One that continues to add it to the conversation of myth, which is, after all, the stories of us.